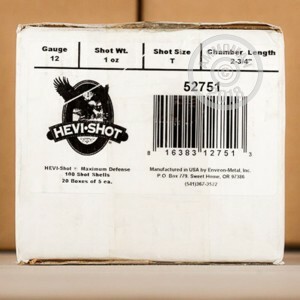 This 12 gauge Hevi-Shot ammunition is a particularly good choice for defending your home if you're concerned about over-penetration. 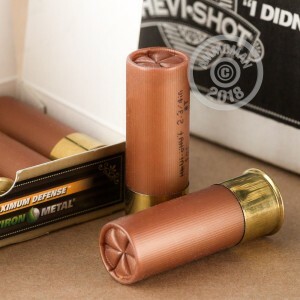 These 2-3/4" shells fire a 35-pellet load of T-size shot (slightly smaller than #4 buck) that will put an assailant down quickly at close quarters without going through and causing collateral damage. At the same time, the high pellet count increases hit probability even on a less than perfectly aimed shot. These shells are loaded in Sweet Home, Oregon using alloyed shot made of tungsten, nickel, and iron. 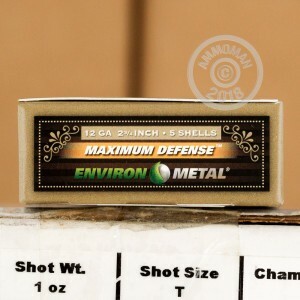 They are lead-free and produce a muzzle velocity of 1,350 feet per second.